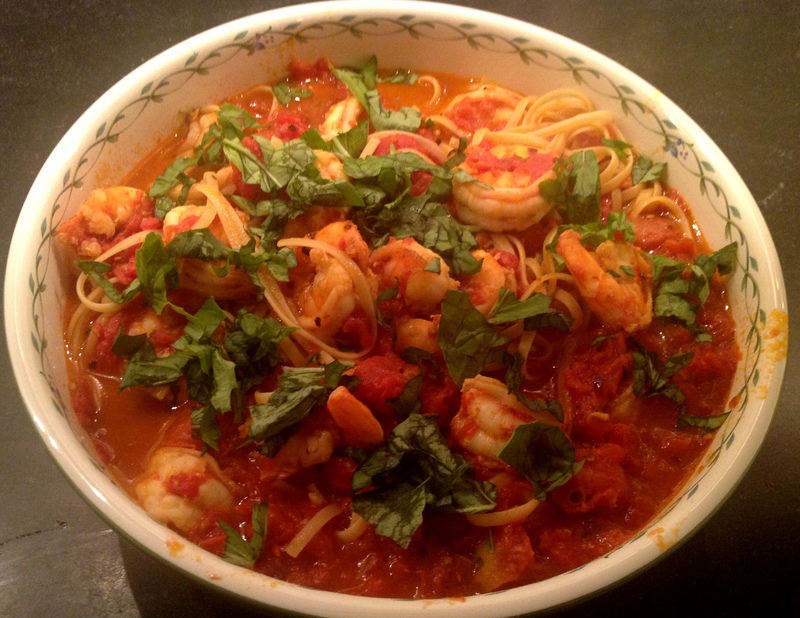 Fellow blogger, Chef Mimi recently posted a fabulous recipe for “Sweet Chili Shrimp.” When I read it, my mouth began to immediately water, so I decided to make it that night. Except for the shrimp, we had in our larder all of the other ingredients that she had listed. We picked up a pound of jumbo shrimp from the fishmonger and stopped off at the grocer for a couple of crowns of broccoli, which is our own addition. You’ll also need ¼ cup of chicken broth to finish the sauce. 1. 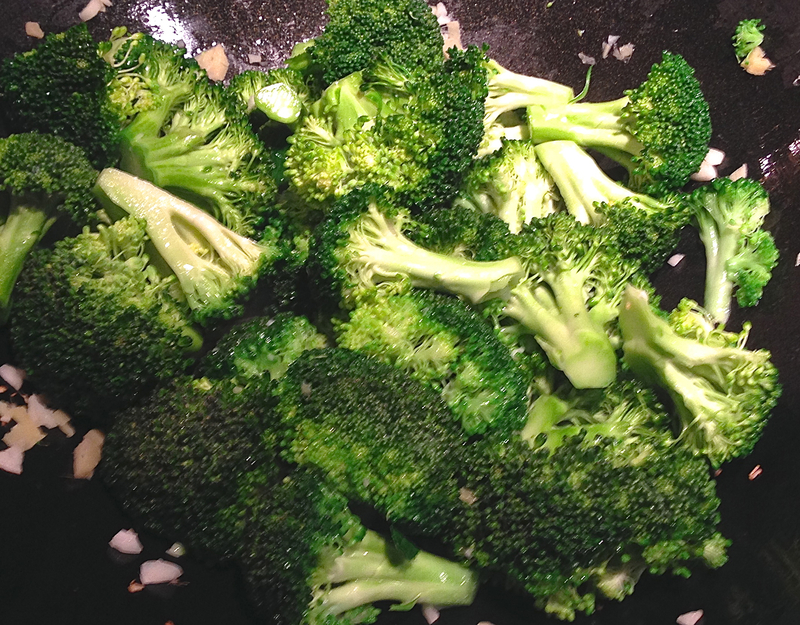 Wash the broccoli and soak in cold water while you chop the garlic and ginger and prepare the other ingredients. 2. Heat the peanut oil on high in a wok. 3. When a drop of water sizzles in the oil, swirl the oil around about half way up the sides of the wok. 4. Add the garlic and ginger and stir for about 30 seconds. 5. Spin-dry the broccoli, then add to the wok and stir-fry for about 2 minutes, until the broccoli takes on a rich bright green color. 6. Add the soy sauce and stir well. 7. Add the chili-garlic paste and the water and continue stirring for about a minute more. 8. Remove the broccoli and set aside. Once the shrimp are cooked, return the broccoli to the wok, mix the two together well for a minute or two on high heat, then transfer to a serving bowl. Add ¼ cup of chicken broth to the wok, bring to a boil and deglaze the wok, scraping up the fond. 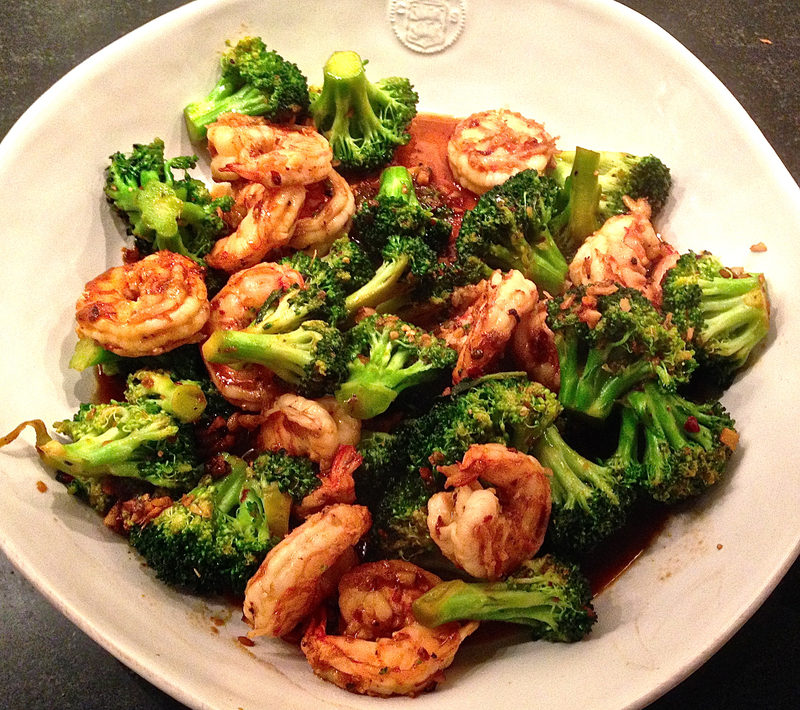 Pour sauce over shrimp and broccoli and serve at once. Having been stationed at Air Force bases in Texas and Mississippi, “when I wore a younger man’s clothes,” I became intimately familiar with Grits, as they were served in the mess hall at every breakfast. I recall them perfectly, white, gummy and tasteless. The only way that they became even slightly edible was drowned in butter, salt and sugar. Last month, while visiting my cousin outside of Beaufort, South Carolina, I happened to mention that we were stopping in Charleston, as we continued on our drive north. She said to me “you have to try Shrimp and Grits, when you get to Charleston!” Recalling that gooey, bland mess to which I had been subjected while living “Down South” in the service of Uncle Sam, I thought boiled shrimp in boiled grits? Not for me! Upon arriving in Charleston the following afternoon, we checked into the HarbourView Inn, located right in the heart of the historic district. We asked the concierge to recommend a nearby restaurant for a late lunch, and he suggested Slightly North Of Broad (SNOB), as it is just around the corner from the hotel. Sure enough, Maverick Shrimp & Grits were prominently displayed on the menu. However, the description sounded infinitely superior to the vision that was in my mind, so I thought what the heck, and went ahead and ordered them. Having cleaned my plate of every last morsel of grits, the waitress commented that I had obviously enjoyed them. I explained my hesitation in ordering them, based on previous association, but that the dish had far exceeded my expectations. She explained that there are a variety of grits, each with differing qualities, and that theirs were stone-ground in small batches.When I inquired if Chef Lee had a cookbook, she said that unfortunately he did not, but she was kind enough to give me a copy of his recipe, which I have adapted herein. She also recommended that I visit their affiiliate, Charleston Cooks, a delightful gourmet shop next door, where I was sure to find a bag of good quality grits to take back to the north. I hope that you try these Grits, as they will make a Grits lover out of any darn Yankee. 1. In a 3 qt. pot with a heavy bottom, bring the water, salt and 1tbsp. of the butter to a boil. 3. Remove pot from the heat, add 1 tbsp. of the butter and mix well. Add the cream and mix well again. Taste, and adjust the butter and cream to your liking. Keep warm. 1. Slice the ham and sausage, slice and dice the vegetables, clean the shrimp and assemble the other ingredients. 2. Heat a non-stick sauté pan and add 1 tbsp. of butter. When melted, add the ham and Andouille sausage and sauté. 3. When the meat is lightly browned, add the tomatoes, scallions and spices, and sauté for 2 or 3 minutes stirring occasionally. 4. Add the shrimp and sauté for about 3 or 4 minutes until the shrimp are pink. 5. Add the chicken stock and bring to a boil. 6. Add the remaining butter. Divide the grits equally between two plates. 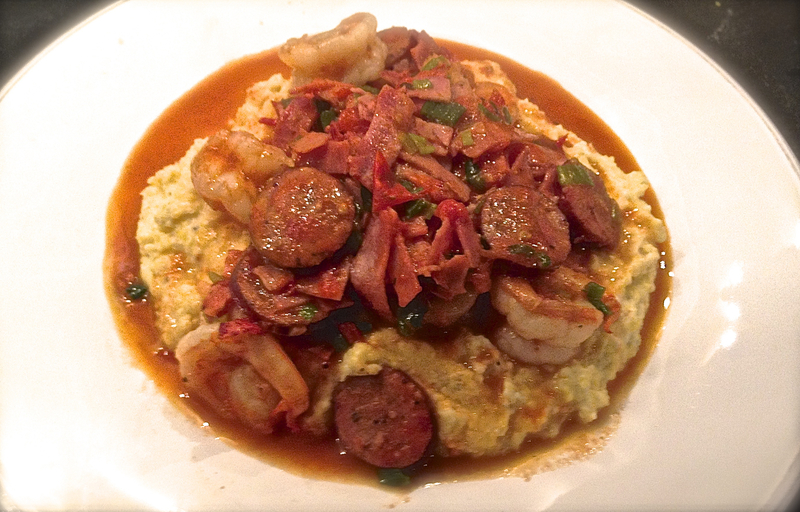 Place 6 shrimp per person on the grits and spoon equal portions of the topping over each.